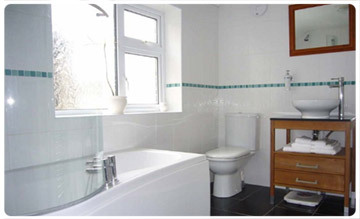 D.R Bond have vast experience in all aspects of wall and floor tiling including ceramics, natural stone and mosaics. Professional retiling of your Bathroom will enhance its beauty, allow it to be easily cleaned and also add value to your property. We can advise you on the best styles, colours and type of tile to enhance your chosen room or work with tiles that have already been chosen. We offer a choice of grout colours and use anti bacterial and mould resistant grout as standard! Natural stone tiles can be enhanced to add extra depth to their colour and added protection against staining.